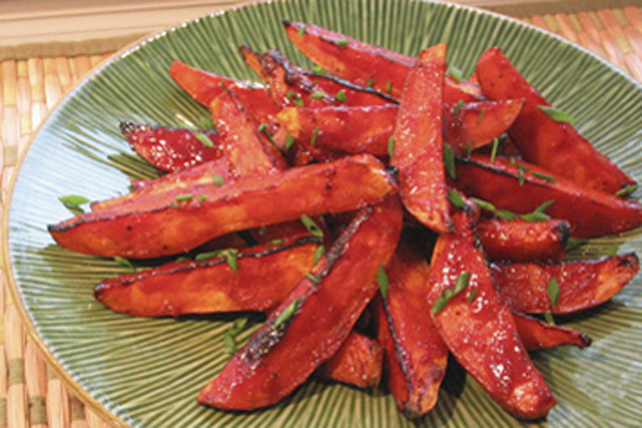 An easy-to-make glaze makes these baked sweet potato wedges extra special. Toss potatoes with oil; place, skin sides down, on foil-covered baking sheet. Bake 25 min. or until tender. Meanwhile, bring all remaining ingredients except chives just to boil in saucepan; simmer on medium-low heat 10 min. or until thickened, stirring occasionally. Keep warm until ready to use. Remove potatoes from oven. Heat broiler. Brush potatoes with half the ketchup mixture. Broil, 6 inches from heat, 5 to 10 min. or until glaze is hot and bubbly, turning and brushing occasionally with remaining ketchup mixture. Transfer potatoes to platter; sprinkle with chives. Serve with light sour cream for dipping. This flavourful glaze is equally delicious when tossed with hot cooked carrots or squash.